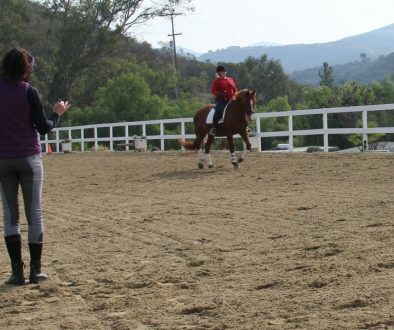 Specific muscles engage to counterbalance and support the body of a horseback rider over the jump or fence. As the horse takes off from the ground, the core of the rider should self support. Using ones own physical strength helps self support over the jump. One also achieves more dynamic power when muscle mass increases in the lower body. Build the necessary endurance for a more balanced and stable jump by increasing strength in the legs, upper back and chest. Add the routine to your weekly workout program and see the results for yourself. Grip a 25 pound plate or free weights, in front of the body with palms facing towards you. Let your arms hang with the weight at the lowest point standing straight up. Place feet firmly into the ground with a slight bend in knees. Try not to move the lower body while lifting the arms up. Slowly pull the weight upward to the front of your throat with both wrists moving together as you lift the weight up. Elbows must be higher than the wrists at all times. Hold with both hands whatever’s available such as a plate, barbell, medicine balls or feed bag. Hold your object close to your stomach. Bend forward at the hips and with the knees into an angle that is comfortable for your lower back. At this point, make sure to engage the lower core to support this bent over position. Release the weight away from the stomach, keeping the position and slowly bring it back to the body. Let the elbows come back behind your torso and add a squeeze between the shoulder blades. Do the row without rocking the body or losing the angle of your bent over position. Still holding your weight/medicine ball/free weights with both hands, stand straight up and press the weight up above the chest! Keep a slight bend in the arms when arm is extended. Locking out the arm, disengages the muscles needed and can lead to injury or strain in the elbows. Watch the body shifting backwards with each repetition. Use the core to counter balance, similar to the core engagement that you need flying over a jump. Holding a kettle bell or plate/free weight with one hand, let it hang one one side of the body as you’re standing straight up. 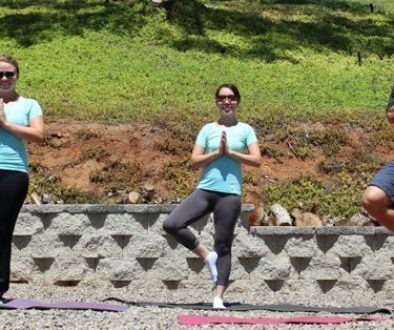 Ground the feet flat into the mat and make sure the shoulders are even, above the hips. Tilt to the side and bend down with the weight, as if to touch the side of your knee. Bend through the stomach and not in the hips. This movement is to open the sides of your stomach and base of your lower back. Once you feel the pelvis start to move, slowly raise the shoulder and weight back to starting position. Now hold the kettle bell or plate/free weight with both hands and position the feet wider than shoulder width apart. Squat straight down so thighs are parallel to the ground. Engage the core to prevent the upper body from collapsing downward. 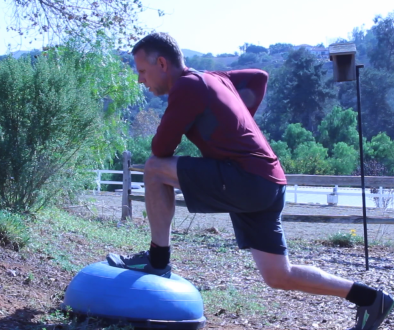 This strength will help you stay upright on the horse in and over the jump. Make sure the knees are behind the toes when lowering down into the squat. If you see this happening, don’t worry about going all the way down. Instead, pause and go back to standing straight up. Tightness prevents for full range of motion, try to limit your range of motion squatting until you become more mobile. ONLINE MEMBERS HAVE ACCESS TO WORKOUTS, PRIVATE BLOGS ON POSITION PROBLEMS, NUTRITION AND MUCH MORE.